Traditionally innovative - more than eight decades on the road to success. 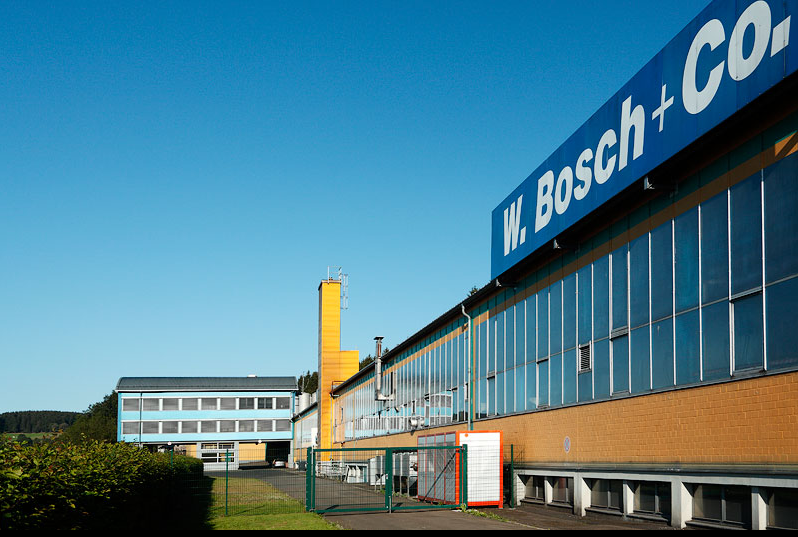 Market-oriented management, targeted investments and highly skilled employees – these are the secrets to the success of W.Bosch+Co. These philosophies helped a small firm develop into one of the world’s leading producers of processed and coated sheet materials like paper, fabric, and aluminium and plastic films. Perfectly equipped for superb performance. Our extensive range of machinery allows us to produce a wide range of products that are enjoyed by our international customers of high repute. Our manufacturing techniques include laminating, extrusion coating, impregnation and creping. We are also one of the few companies in the world that can laminate solvent-free up to a width of 1750 mm. This means, depending on the individual order, that we can produce in bulk and customised small series with reliable and professional results. We had a typical start: production at home in the garage. In 1937 Walter Bosch founded the Walter Bosch & Co. manufacturing company to produce waxed paper and grew the company systematically. New ideas increased the company’s success. The company moved out of the garage into a small production space, and in 1966 it moved again into its current 8500 m² premises where it now provides secure employment for a workforce of around 80. More than eight decades and a host of innovations later, the company is now renowned for producing a range of products that are in global demand. In his home garage Walter Bosch founded the Walter Bosch + Co. manufacturing company to produce waxed paper. With bituminous and double-bitumen papers, Walter Bosch produces a cost-effective paper with a water barrier for inner layers of export crates, for barracks construction and cable insulation – the first successful product. Purchase and commissioning of a coating machine with a working width of 1,700 mm. Market launch of the “Betolith®” brand. Installation of a web guider and construction of a mixing hall with a 5,000 kg dissolver, a mixing and dispersing system. “Betolith®” is a retarder paper based on double-bitumen paper. It is used for the production of more even washed-out concrete plates – another successful product by W.Bosch+Co. Purchase and commissioning of a new coating unit. Certification according to DIN EN ISO 9001, purchase and commissioning of a sleeve cutting machine. Our quality management is certified according to the globally recognized standard. Adherence to highest quality standards remain at the forefront of our modern corporate philosophy. Market launch of a self adhesive, aluminium laminated cardboard, used as damping plate inhousehold machines. Purchase and commissioning of a short roll winder. Market launch of Puma-Folie® clear and Puma-Folie® low seal. Puma-Folie® clear is a transparent water vapour barrier for export packaging, with which customs control can be made without cutting the packaging. Puma-Folie® low seal is a aluminium compound material, developed to be combined with Puma-Folie® clear. Purchase and commissioning of a second lamination line for solvent free adhesives. The new machine doubbles the production capacity for Puma-Folien®. Purchase and commissioning of a lamination and coating line with a working width of 2,300 mm. The brand new machine measures more than 5 m in width, 70 m in length and nearly 6 m in hight. She was delivered in 49 oversee container boxes. Installation took 6 months. Purchase and commissioning of a waxing machine with a working width of 1,600 mm. Additional sizes of oil and paraffined papers are available. Individual sheets of those papers are used for export and transport packaging, mainly for wrapping of tools and knifes as a good protection againts humidity. Another successful product by W.Bosch+Co. Relocation of the company near Wasserfuhr with new equipment. A new 8,500 m² company site was built on a former station of the railway line from Wipperfurth to Halver. Purchase and commissioning of the then largest coating machine in Europe with a working width of 2,600 mm, a laminating machine with 1,700 mm working width and a cross cutter. Purchase and commissioning of a creping machine with a working width of 2,300 mm. W.Bosch+Co. extended the product range with another successfull product: crepe papers. The particularly versatile and lightly padding crepe paper efficiently protects sensitive surfaces and materials from scratches and dirt. Purchase and commissioning of a new cutter. Purchase and commissioning of a lamination line for solvent free adhesives. A new line for Puma-Folien® brings some extra production capacity. Market launch of Brite-Folie – a washable, UV-resistant film as outer layer for PU insulation boards. External certification and confirmation of the effectiveness of VCI papers and VCI films made by W.Bosch+Co. The German “Institut für Verpackungsprüfungen, Beratung, Forschung, Systemplanung, Verpackungsentwicklung und -prüfung e.V.” (BFSV) confirms the corrosion-protective effect of W.Bosch + Co.´s VCI papers and VCI films. Purchase and commissioning of a sealing line for Puma-Folien®. This widens the available range of finishes of on of the main products. W.Bosch+Co. can now supply half tubal, tubal and side gusseted tubal foils, flat bags and side gusseted bags made of Puma-Folien®.